Norwalk has an opportunity to make a difference. 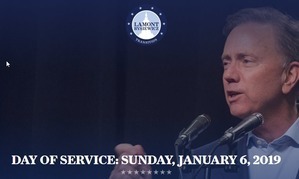 Our newly elected Government officials have announced the Connecticut Day of Service taking place on Sunday, January 6, 2019, just three days before Governor-elect Ned Lamont is sworn in as Governor of Connecticut. Lamont and Lt. Governor-elect Susan Bysiewicz, will spend the day volunteering at and learning more about non-profit organizations in cities and towns across Connecticut. They invite Connecticut residents to join them on January 6 as they roll up their sleeves and support a host of nonprofits across the state including. Male & Female Veterans' shelter that has helped over 1,100 veterans by providing shelter, food & support to military veterans. Join us as we prepare a lunch and talk with our brave vets. For a complete list of the venues and to register to participate in Connecticut’s Day of Service, https://www.lamonttransition.org/day-of-service" target="_blank">click here.